Published on December 14, 2018 in Winnipesaukee Resort. Closed Tags: Lake Winnipesaukee Resort, ski mountain lodging in nh, ski mountains in nh. Winter certainly started early this year with our first snow hitting before Thanksgiving and the temperatures hovering around freezing for months now. Our local ski mountains are already open and working hard to add to the natural snowfall with machine-made powder freshly groomed and ready to be carved. This year we are offering some of the best discounts at multiple different mountains. 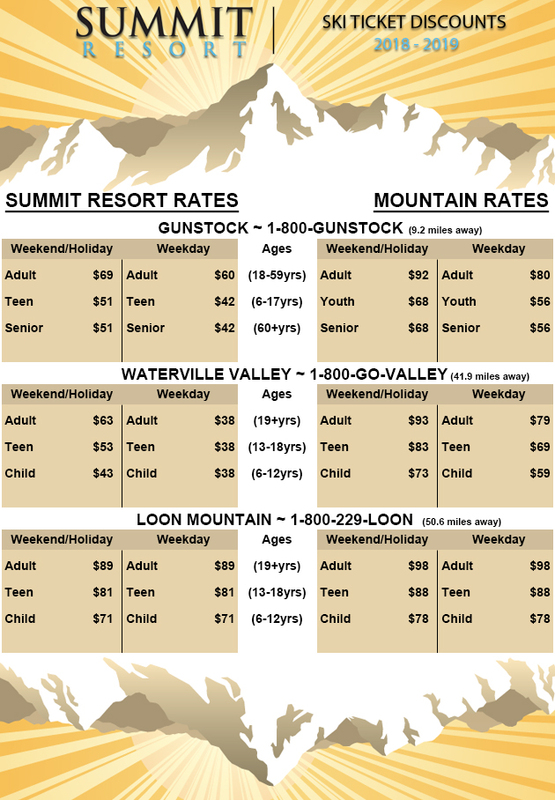 The Summit Resort is the perfect destination for Gunstock Lodging. We are lucky enough to have Gunstock Mountain right in our neighboring town of Gilford. Gunstock has 227 skiable acres including 3 terrain parks and unbeatable views of the Lakes Region. When you stay here with our Gunstock Ski and Stay package you are able to spend less time on the road and more time on the slopes with a short fifteen-minute drive to the mountain. The package offers 20% off of your room rate and 25% off tickets for each guest in your reservation. While at the mountain, be sure to check out their tubing hill, mountain roller coaster and cross-country ski trail network! 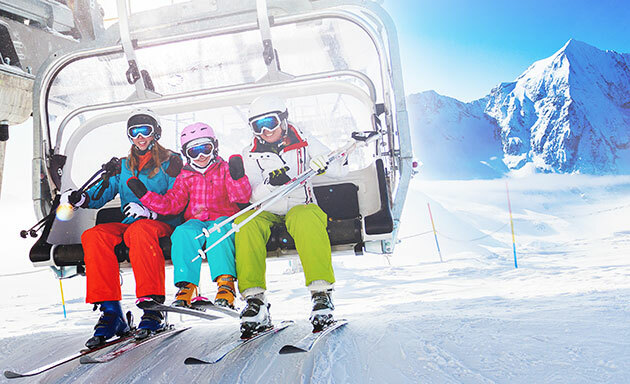 If you plan to head up to the White Mountains, just under an hour drive away, we offer discounted ski and snowboard tickets to two of the best and well-known ski areas: Loon Mountain and Waterville Valley. Loon Mountain is located in the heart of the White Mountains and has 370 acres open for riding and a progression of 6 terrain parks open for all different levels of riders from beginners to experts. Waterville Valley has 265 acres to ski and has undergone a few upgrades including renovating their base lodge, adding 500 new snow making guns, and completed their Green Peak expansion! Waterville has 4 terrain parks, including one named Stillness, a brand new skate-styled park. Be sure to stop in at the front desk to inquire about all of our great discounted ticket rates. After a long day at the mountain of your choosing you can come back to the resort to enjoy some nice rest and relaxation in our oversized Roman Spa hot tub or in the comfort of your spacious suite large enough for the whole family or a weekend away with your friends. Published on January 23, 2018 in Winnipesaukee Resort. Closed Tags: Lake Winnipesaukee Resort, ski mountain lodging in nh, ski mountains in nh. Winter is here and the snow is falling which means ski mountains are open for the 2018 season! For great deals on ski and stay getaways and tickets, the Summit Resort is your ideal destination for ski mountain lodging in NH this winter. Our suite style vacation condos offer an abundance of space with plenty of room for guests and their gear. Enjoy discounted tickets to Gunstock Mountain, Loon Mountain, and Waterville Valley. Gunstock Mountain is located just 15 minutes away from the resort, and we are currently offering the perfect Gunstock Ski and Stay getaway package that includes 20% off accommodations and 25% off ski tickets to Gunstock Mountain for each night of your stay. 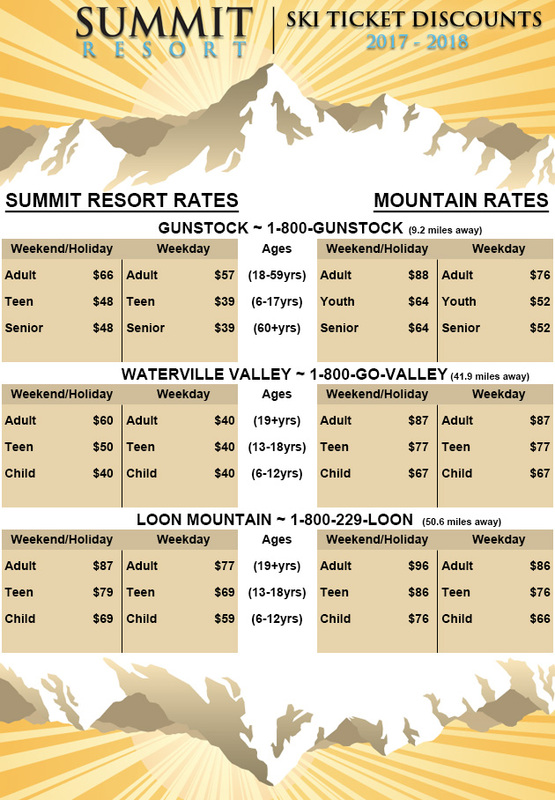 The Summit Resort is the ideal destination for Gunstock Lodging. The mountain is great for skiers and riders of any level, they offer 55 trails and beautiful views overlooking the Lakes Region from the peak. Loon Mountain sits in the White Mountains of New Hampshire in the quaint ski town of Lincoln. The mountain offers three different peaks to cater to an individual’s ski or snowboard level. Enjoy a ride up Loon Peak in a gondola and appreciate the beautiful snow-covered mountains that surround the area. 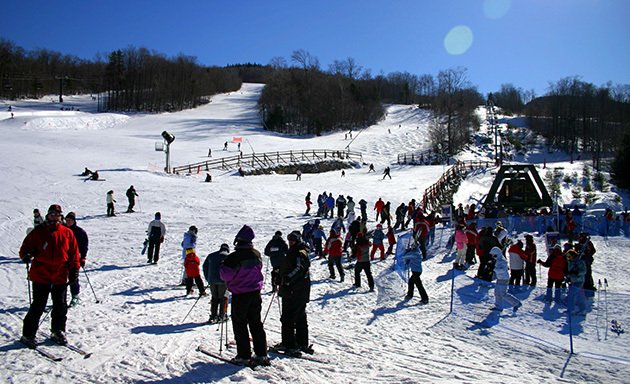 They offer a variety of other winter activities that include a Winter Zipline, Cross Country Skiing, Tubing, Ice Skating, and snowshoeing. Check in the with our front desk to learn more about discounted ski tickets to Loon Mountain. Waterville Valley is situated in the White Mountain National Forest. The mountain offers over 265 acres of terrain and trails for all levels of skiers and riders. Waterville offers a more unique experience with their ease-in terrain park, and NASTAR ski racing courses. For more information on discounted ski tickets to Waterville Valley ask for more details at the front desk. After a long day on one of these Ski Mountains in NH head back to the resort and enjoy a nice soak in our roman spas, or relax in the comfort of your suite with a cup of hot cocoa.